Below are the 2016 and 2017 webinar recordings. Click on the accordion panels to view the videos. 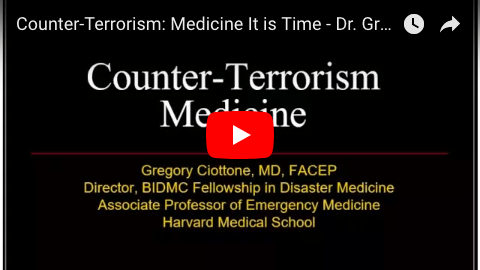 Counter-Terrorism Medicine is a new area of expertise mandated by the increasingly complex and devastating terrorist attacks seen recently around the world. We are facing an emerging healthcare crisis, the first to arise in the 21st century. War is evolving from two armies facing off on a battlefield to asymmetric, multi-modality attacks on civilians in our metropolitan centers, mass gathering sites, and transportation hubs. In a world where high-profile events such as those in Paris, Brussels, Nice, and London occur all too often, and lower-profile attacks on soft civilian targets are a nearly daily occurrence, we must learn to be proactive rather than reactive in the steps we take. It is time we define exactly what the unique mitigation, preparedness, and response measures to asymmetric, multi-modality terrorist attack are, and how public health systems, healthcare facilities, and EMS responders must implement them. Terrorist attacks often result in a surge of specific ballistic and blast-related wound patterns that put high demand on our healthcare systems. In addition, both responders and healthcare facilities are now being either primarily or secondarily targeted as well, demanding a higher awareness of specific scene safety and target-hardening issues. Combined with the need to prepare for CBRNE possibilities in future terrorist attacks, these new challenges facing our hospital-based and EMS personnel must be addressed through specific Counter-Terrorism Medicine practices. The recent surge in asymmetric attacks is a healthcare crisis, one that will likely escalate over time. As we inadvertently present “soft” targets through our very open societies, terrorists will continue to attack us in ways designed to maximize casualties. Likewise, responders and hospitals will be increasingly targeted, as they are the frontlines of this crisis. We must fuse the lessons we have learned from accidental and natural disasters into the steps we take to address intentional attacks. In order to be most effective, while also protecting the safety of personnel, Counter-Terrorism Medicine practices must be learned, understood, and implemented. The September 11th, 2001 terrorist attacks (9/11) killed nearly 3,000 people including 413 emergency first responders. Whilst New York rebounded strongly following 9/11, one of the painful legacies of the disaster is the lasting effect on the physical and mental health of thousands of individuals who survived the attacks — including the 9/11 responders. Now, sixteen years after 9/11, the impact on the responders and their families is ongoing. They are still impacted by long-term physical and psychosocial consequences of that day – traumatized by 9/11 – because what they experienced has not ended. New cases of 9/11-related illness are diagnosed regularly. Cancer rates are around 15% higher in those who were exposed to Ground Zero compared to those who were not. More than 1,000 responders have died in the years following 9/11 of causes directly related to the time they spent on “the pile.” Over 7,000 are currently being treated for 9/11-related illnesses and some 2,500 responders have retired due to 9/11-related disability. The reality is that the death toll from the terrorist attacks grows larger each year, and while the physical wounds may have healed, the emotional scars remain for many. Associate Professor David Heslop from the University of New South Wales presents: The CBRNE Prehospital Major Incident Environment - Recent Advances and Persistent Gaps Impacting Casualty Treatment, Medical Operations, and Decontamination Operations. Japan has historically experienced numerous disasters as a result of being located on the “Pacific Rim of Fire.” Japan was also the target of a CBRNE disaster that happened in 1995, the Sarin Subway event. The webinar will present the fast development of disaster health (with a particular focus on disaster nursing in Japan), summarize the contemporary history of disaster nursing in Japan, and provide an overview its organizational system, particularly in disaster situations. There is an emerging interest in the need to demonstrate a sustainable health legacy from mass gatherings investments. The World Cup and the Olympic Games were opportunities for the Brazilian government to develop a specific policy regarding Mass Gatherings. This seminar provides an overview of the process developed to identify, classify, and evaluate legacy of healthcare planning in the host city of Porto Alegre for the World Cup 2014. The webinar discusses examples from the literature on how this development allowed the government to assess and evaluate the available resources to provide crucial support, and build capacity for future events, such as the 2016 Olympic Games. Disaster responders need evidence to help guide their decisions as they plan for and implement responses. Disaster risk reduction requires evidence for policies and programs. The need for evidence creates an ethical imperative to conduct research on and in disasters. Some of that research involves human participants and raises another ethical imperative to protect participants. This webinar provides an overview of some ethical challenges arising from balancing these dual imperatives in disaster research. Such issues have been highlighted by the inclusion of disaster research within the 2016 revision of the Council for International Organizations of Medical Sciences (CIOMS) ethics guidelines for biomedical research. The webinar discusses examples from medical intervention research during the Ebola outbreak and with qualitative research in humanitarian crises. Disaster research also challenges current approaches to research ethics approval procedures and some modified approaches will be examined. The webinar was being co-hosted by the Division of Bioethics, The Ohio State University College of Medicine and the Center for Disaster & Humanitarian Ethics. Authoritative information is critical in the preparation for and response to disasters and public health emergencies. Scattered across a myriad of sources, information can be difficult to find and even harder to evaluate for credibility and reliability. Using the Internet can take hours of searching to find elusive but critical documents. As the world’s largest aggregator of biomedical literature, the US National Library of Medicine (NLM) has a set of information tools, apps, and databases that can provide authoritative, evidence-based information critical prior to and during a disaster or public health emergency, making searching more effective and efficient. Elizabeth Norton from NLM demonstrates the use of Disaster Lit®, an NLM database containing the often hard to find guidelines, white papers, trainings, and other important materials that are published in a wide range of places, and about a set of HAZMAT/CBRNE information tools that assist responders in the field. Participants will also learn about PubMed Central, a free full-text archive of biomedical and life sciences journal literature containing the best peer-review and most recently published research results. The webinar will also cover the Emergency Access Initiative (EAI), a collaboration between NLM and publishers to provide temporary free access to full-text articles to healthcare professionals and libraries affected by disasters. On 27 January 2013, a fire at the Kiss Nightclub in Santa Maria, Brazil led to a mass-casualty incident affecting hundreds of college students. A total of 234 people died on scene, 145 were hospitalized, and another 623 people received treatment throughout the first week following the incident, eight of whom later died. The military police were the first on scene, followed by the state fire department, and then the municipal Mobile Prehospital Assistance (SAMU) ambulances. The number of victims was not communicated clearly to the various units arriving on scene, leading to insufficient rescue personnel and equipment. Incident command was established on scene, but the rescuers and police were still unable to control the chaos of multiple bystanders attempting to assist in the rescue efforts. The Municipal Sports Center (CDM) was designated as the location for dead bodies, where victim identification and communication with families occurred, as well as forensic evaluation, which determined the primary cause of death to be asphyxia. A command center was established at the Hospital de Caridade Astrogildo de Azevedo (HCAA) in Santa Maria to direct where patients should be admitted, recruit staff, and procure additional supplies, as needed. The victims suffered primarily from smoke inhalation and many required endotracheal intubation and mechanical ventilation. There was a shortage of ventilators; therefore, some had to be borrowed from local hospitals, neighboring cities, and distant areas in the state. A total of 54 patients were transferred to hospitals in the capital city of Porto Alegre (Brazil). The main issues with the response to the fire were scene control and communication. Areas for improvement were identified, namely the establishment of a disaster-response plan, as well as regularly scheduled training in disaster preparedness/response. These activities are the first steps to improving mass-casualty responses. During a mass gathering, some participants may receive health care for injuries or illnesses that occur during the event. In-event first responders provide initial assessment and management. However, when further definitive care is required, municipal ambulance services provide additional assessment, treatment, and transport of participants to acute care settings, such as hospitals. The impact on both ambulance services and hospitals from mass-gathering events is the focus of this presentation. In particular, a case study of one outdoor music festival in 2012 in the Australian Capital Territory with approximately 20,000 participants will be analysed. This festival had one first aid post and a health team staffed by doctors, nurses, and paramedics. Mass gathering events pose challenges to the most adept of public health practitioners in ensuring health safety of the population. These mass gatherings can be for sporting events, musical festivals, or more commonly have religious undertones in developing countries. The Kumbh Mela in Allahabad, India in 2013 may have been the largest gathering of humanity in the history of mankind with nearly 120 million pilgrims having thronged the venue. The scale of the event posed a challenge to the maintenance of public health security and safety. A snapshot of the experience of managing the hygiene and sanitation aspect of this mega event is being presented in this webinar, highlighting the importance of proactive public health planning and preparedness. The evident flaw on post-event analyses is the failure to adequately cater for environmental mopping up operations on winding up. Dr. Bograkos received his Disaster and CBRNE training during his 28 years of military service. Col. Bograkos has served both the US Army and Air Force as a military Flight Surgeon, Family Medicine, and Emergency Medicine physician. Operational experiences include: MP BN Surgeon, WMD SOD, & NATO PK Division Surgeon. He has served the Pentagon’s “Civil Military Emergency Preparedness” office as a Bioterrorism/ Medical Consultant (PfP Black Sea Initiative), briefed at the “First Interpol Global Conference on Preventing Bioterrorism” in Lyon, France (2005), and has instructed with DoD, DoJ, DHS, and NATO. Colonel Bograkos graduated from the US Naval War College “with distinction” in 2009. He received his MA in National Security & Strategic Studies (AOS Irregular Warfare / narco-terrorism) with distinction in 2011. He is a Clinical Professor of Medical Military Science, Family Medicine, and Emergency Medicine at the University of New England, College of Osteopathic Medicine. Tony is a nurse and an academic practicing within prehospital care, including regular attendance at mass gatherings within the United Kingdom. He is the Honorary Secretary of the British Association for Immediate Care (BASICS). Tony is a member of the Crowd Medical Team for Millwall FC and regularly teaches BASICS courses and the Crowd Doctors course for the Faculty of Prehospital Care at the Royal College of Surgeons of Edinburgh. Tony’s webinar reviews his research concerning the role of advanced nurse practitioners in admission avoidance at mass gatherings. Using a quantitative approach, Tony demonstrated a statistical benefit that was supported by an identifiable and meaningful outcome. Dr. Endericks works at Public Health England and has years of experience with mass gathering events such as the London Olympics and European World Cups. She presents an overview of the updated public health for mass gathering - key considerations document, "lessons learned" from London 2012 Summer Games, and the work that is being done to support the planning for Rio 2016. Dr. Drury presents an introduction to the psychology of crowd behavior explaining how social identity principles have been used to explain mass emergency behavior. It describes recent research on mass gatherings (a music festival and the Hajj pilgrimage) using the social identity approach, showing how crowd self-regulation processes can complement formal crowd safety management practices. For more information about Dr. John Drury, please visit - http://www.sussex.ac.uk/profiles/92858.